Nissan Leaf and Tesla Model S sales are surging, leading to the highest ever monthly sales of electric cars for March 2013. While Nissan's 2013 Leaf is setting sales records, the overall market for electrified vehicles is beginning to take off. March 2013 saw the largest sales of all electric vehicles ever, and the first month where all electric vehicle sales outstripped plug-in hybrid sales. It's not just a one-month blip either, but there is a solid trend of electric vehicle sales growth in EDTA's figures beginning in September 2012. This turns out to match the growth of Tesla Model S sales. EDTA's figures do not break down sales by model, unfortunately. They show in March 2013 hybrid sales were 46,327 units, plug-in hybrid sales were 3,079 units, and battery electric sales were 4,553 units for a total of 53,959 units. In Feb. 2013 the figures were 40,173 hybrids, 2,789 plug-in hybrids, 2,616 battery electrics, for a total of 45,578. In Jan. 2013 the figures were 34,611 hybrids, 2,354 plug-in hybrids, 2,022 battery electrics, for a total of 38,987. The totals for 2013 stand at 121,111 hybrids, 8,222 plug-in hybrids, and 9,191 battery electrics. TorqueNews' own reporting focuses on Nissan Leaf and Chevy Volt, with Nissan sold just 1,303 Leaf's in January and February combined and surging to 2,236 Leaf's sold in March, for a total of 3,549 sold since the beginning of the year. For the Volt the figures are 2,766 Volt's for January and February combined, 1,478 Volts in March, and 4,244 sold for the year. The way the EDTA structures its numbers doesn't help us gauge which specific car is ahead (or behind) in the horse race, but it does show us the overall trend of market growth in electrified vehicles. The year-on-year sales growth is tremendous, with 2010 total sales of 274,555 electrified cars, 2011 total sales of 284,064 electrified cars, 2012 total sales of 487,480 electrified cars, and 2013 so far total sales of 138,524 electrified cars. If 2013 electrified car sales remain at the same rate, it will top 550,000. How do we interpret this when EDTA claims there were 9,191 battery electrics sold in 2013 and Nissan accounts for only 3,549 of those cars? Where do these numbers come from? Is the EDTA making them up? The answer is that there are other battery electric cars on the market besides the Nissan Leaf. Similarly the plug-in hybrid sales for 2013 of 8,222 cars is much more than the 4,244 Volt's sold so far, and there are now other plug-in hybrid's on the market such as the Ford Energi's. The largest selling electric car in North America so far in 2013 was not the Nissan Leaf, but the Tesla Model S. Unfortunately that claim has not been fully verified, because Tesla Motors does not release monthly sales figures. Over the weekend when the company announced it was likely to be profitable in Q1 2013, Tesla also said that Model S sales in Q1 2013 was approximately 4,750 units. A couple weeks earlier Tesla claimed they'd been delivering over 500 Model S's per week. We'll know better when Tesla makes their Q1 2013 SEC filing in 2-3 weeks, because those filings contain certified audited results. Another factor in this is the growth of Nissan Leaf sales following the release of the 2013 Nissan Leaf. The base MSRP of the 2013 Leaf is only $28,800 putting its price within the range of the hybrid cars, and making it more attractive to prospective customers. The Model S sales, 4,750 units, and Leaf sales, 3,549 units, adds up to 8,299 battery electric cars sold so far in 2013. That still comes up a little short from the 9,191 battery electric cars EDTA claims were sold. However, there are even other battery electric cars on the market, including the Ford Focus Electric, Honda Fit EV, and Smart fortwo electric drive. The growth in battery electric vehicle sales began, according to the EDTA, in September 2012. The sales figures were 837 in August 2012, 1,306 in September 2012, 2,040 in October 2012, 2,211 in November 2012, 2,704 in December 2012, 2,022 in January 2013, 2,616 in February 2013, and 4,553 in March 2013. What's happened over this time frame in electric car sales? Nissan Leaf sales were pretty weak seemingly because the public was collectively waiting for the 2013 Leaf. The main change which occurred was the ramp-up of manufacturing and sales of the Tesla Model S.
The comment that March 2013 is the first month when all electric vehicle sales outpaced plug-in hybrids is not strictly true. 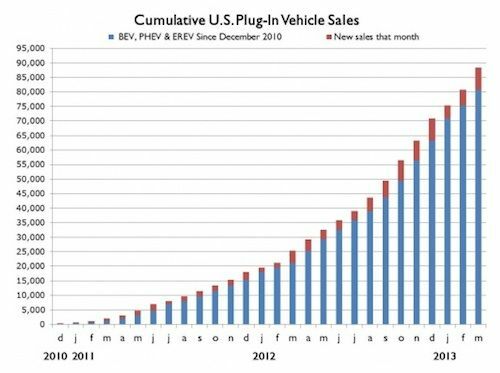 From April - Sept 2011 BEV sales outpaced PHEV's thanks to higher LEAF vs Volt Sales This occurred again in Jan 2012 thanks to higher LEAF sales again. As reported here March 2013 saw a repeat performance. What is different about March 2013 is that this is the first month its been necessary to combine BEV sales for them to outpace PHEV sales vs just comparing LEAF vs PHEV sales. I used hybridcars.com as a source for my sales comparisons.